These are a classic my mother has been making for years. These tiny, bite-sized bites of mexican flavours are seriously addicting. They’re easy to make ahead and throw together when you arrive at your destination. So good luck trying to eat just one. Cook sausage in heavy skillet over medium-high heat until fully cooked, breaking it up with a fork as it cooks. Drain off the fat. Add salsa, cheeses, and green chilies to skillet. Simmer until mixture thickens, about 5 mins. Brush mini-muffin tin with olive oil. Press one wonton wrapper into each muffin cup (let edges stick out top). Bake until wonton wrapper edges begin to brown and bottoms are firm, about 10 mins. If edges brown too quickly, take out of muffin tins and finish on baking sheet. In order to make ahead, leave these in an air-tight container at room temperature for up to one day. When ready to serve, fill each wrapper with a spoonful of the warm sausage mixture. 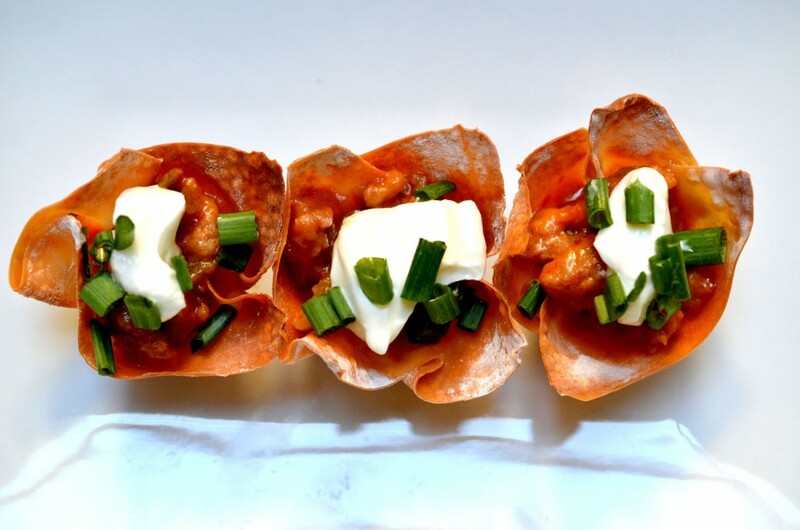 Top with a dollop of sour cream and sprinkle with green onions.